If there is one underlying philosophy that drives Market Street’s approach to every project, it is this: every community is wholly different. Each and every community we’ve worked in has their own concerns, internal capacity, assets, and critics. 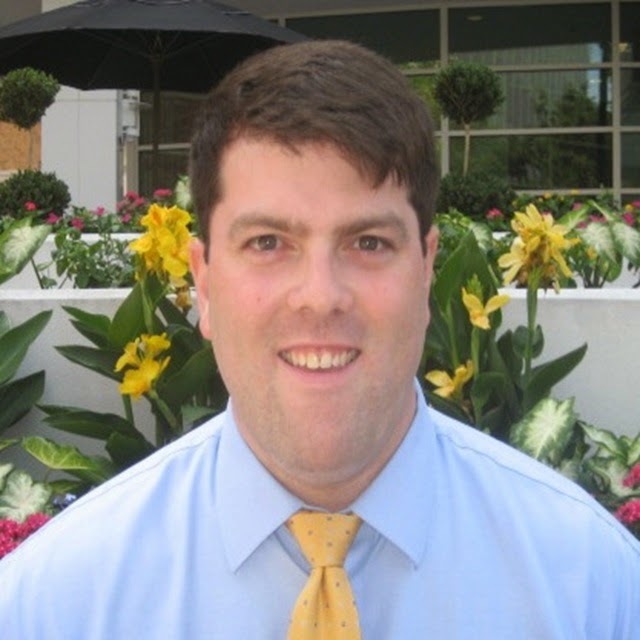 Personally, I’ve had the pleasure of working with a diverse set of communities over my years at Market Street, ranging from Watertown, SD (pop: 27,442) to the Metro Atlanta, GA (pop: 5.3 million). And while each and every community is unique in its own respect, there are pervading themes that crop up during public input. For instance, I’ve yet to facilitate a focus group of workforce development professionals who feel that they’ve completely addressed their talent pipeline. While the underlying issues are completely different, along with the assets and capacity to overcome those challenges, the common concern still exists. Market Street conducts a ton of surveys. Over the past two years alone we’ve handled well over 8,000 responses to community surveys we’ve conducted throughout the country – these responses have immeasurably contributed to strategies that encapsulate the community’s vision and, ultimately, lead to successful implementation. These surveys, when combine; provide a rather unique picture of the types of strengths a community identifies as well as their perceived challenges. Below are two quick graphics that combine over 8,000 open-ended response questions to two survey questions we ask in nearly every community. Words that appear larger were utilized more frequently in open-ended responses than those that appear smaller. What is your community’s greatest strength? The preceding graphic takes over 8,103 responses that we’ve received to an open ended question we ask in a variety of formats, but it boils down to: What is your community’s greatest strength? By far, the most dominate response: people. Those individuals that comprise the community add to its distinct flare, and contribute positively towards the overall health and social fabric – further instilling a strong sense of place within the survey respondent – are most frequently stated as its greatest strength. Simply put, people make the place – which is encapsulated in the next most dominant response: community. Finally, geographic location is also a popular response. This is stated in a variety of formats ranging from proximity to a large metropolitan area (i.e. a small town with big city amenities) to interstate access. Other less frequent, but no less important strengths include quality education systems (schools), low cost of living (cost), economic opportunities, and workforce quality. What is your community’s greatest challenge? As you can see, there is less agreement between respondents over the greatest challenge their communities face: each community is distinct. While some stand out, they are less predominant. Lack is a common response, usually tied to opportunity, jobs, diversity, and quality education institutions (be they higher education or K-12). Interestingly, People as well as Community make an appearance as key challenges – responses usually pertain to individuals resistant to change. Just as individuals positively shape the community so too can others detract. Because many community members intuitively draw the connection between education and continued economic success, Education and Schools are also often cited challenges. While the aggregated surveys show some similarity between key strengths and challenges frequently cited by stakeholders in an assortment of communities over the past two years, the approach to leveraging their strengths and addressing their challenges are exclusive, each requiring individualized strategies that tailor to the community’s internal capacity and shared vision for change - solving a community’s K-12 education challenges, for instance, requires distinct strategies and underlying best practices to inform successful implementation. Our client communities may share common themes, but each is unique. If you’ve looked at our client map, you’ve realized we’ve facilitated many projects in the Atlanta area. It goes without saying that the region’s primary concern is transportation. It appears as large as it does due to our body of work in metro Atlanta rather than being a common trait all communities face. Some of the communities we work in have an average commute time of ten to fifteen minutes. In Atlanta, that’s enough time to get you on the interstate, if you are lucky. At Market Street, we talk a lot about looming workforce skill shortages and education delivery systems that are struggling to produce even adequate results, let alone world-class outcomes. Many of our client communities are dealing with one of these issues and some have the unenviable task of facing both. So pervasive are these issues that it’s only natural to – on occasion – become desensitized to them. But inevitably, a new study or report will be released that quickly brings the true gravity of the situation back to the forefront. Such was the case this week when the Organization for Economic Cooperation and Development (OECD), an international economic organization of 34 developed nations, released its “Skills Outlook 2013.” Now it can be said again, in no uncertain terms: the United States is facing a mounting talent crisis. OECD surveyed approximately 166,000 individuals aged 16 to 65 in 24 countries and sub-national regions to assess proficiency in three areas: literacy, numeracy (mathematics), and problem solving in technology-rich environments. The full results are available in a massive 466-page report, but this article from The New York Times does a good job of summarizing the key issues. On the whole, the United States fared poorly in the assessment, but there is one sliver of data that stands out as the most alarming: performance broken down by 10-year age groups. Among the oldest age group comprised of people aged 55 to 65, the United States performs well in literacy on average, ranking fourth behind Japan, Slovakia, and England/Northern Ireland (Figure 1). But among the youngest age group, 16 to 24 year-olds, things are markedly different. The United States is well below average, ranking fifth worst (Figure 2). So what happened? It’s not the case that younger Americans are less literate. In fact, they score higher than their older counterparts. Instead, the decline is a relative one – other nations have had more success in improving literacy through successive generations. 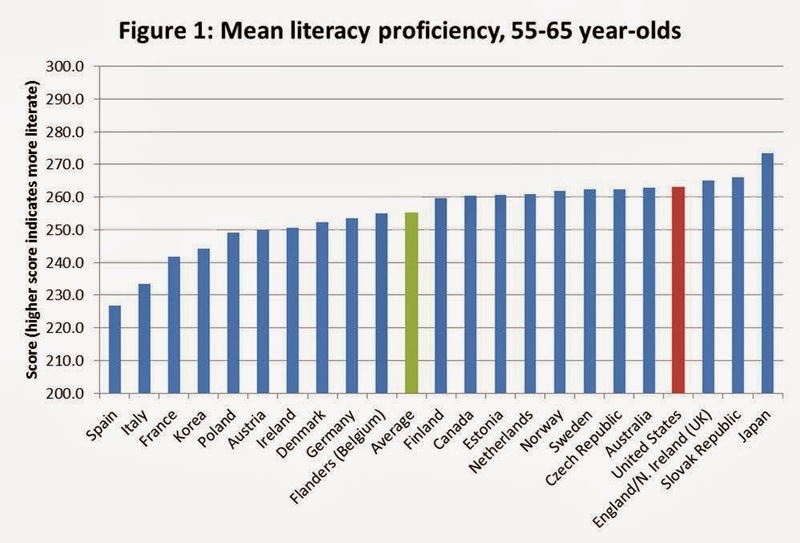 In Finland, the oldest age cohort produced average literacy scores, but younger Finns rank second behind only Japan. In Korea, the difference is even more pronounced: older Koreans rank fourth worst, younger Koreans rank fourth best. And though older adults in the United States did not score as well on numeracy (mathematics), the trend is similar. 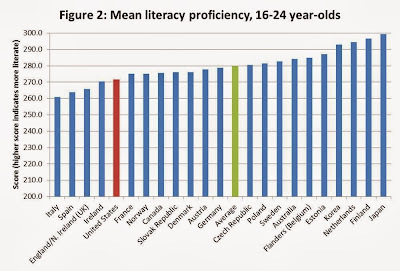 Americans aged 16 to 24 actually had the lowest numeracy proficiency among 22 nations and sub-nations. The world isn’t just gaining on the United States – they’ve already passed us. I agree with Carnevale, particularly on that last point. So logically, the next question should be, “What can be done to fix this?” Here, the answer is more complicated, so instead of offering an incomplete set of prescriptive solutions, I’ll touch briefly on how this work can get done. Ideally, the information in this OECD report and other studies would set off alarm bells that would lead to a concerted, nation-wide effort to improve education. I don’t think it’s overly cynical to say that this will not happen. As I write, the federal government has been shut down for 11 days, and the short- to medium-term prospects for any kind of significant legislative action are dim. Things are not necessarily better at the state level, either. The vast majority of states cut funding for education in the wake of the Great Recession, and seven states have cut per-pupil spending by more than 15 percent. But while the federal government can set high-level policies and states frequently determine curriculums and funding formulas, primary and secondary education still remains largely under local control. This is the level at which concerned parties can have the biggest impact. Many of Market Street’s client communities from around the country have taken bold steps to improve educational delivery systems and outcomes and, ultimately, create a more skilled workforce. One notable example is Nashville. Since 1998, the Nashville Area Chamber of Commerce has supported high-quality candidates for the community’s board of education through its SuccessPAC political action committee. Various public, private, and non-profit leaders in the community have also coordinated their efforts through Alignment Nashville, a 501(c)(3) formed in 2004 to positively impact public school success, children’s health, and the success of the community as a whole. These initiatives are not easy to implement. School board elections can be contentious, and being involved in them requires conviction and courage on the part of the community’s business leaders. The members of Alignment Nashville’s 23 distinct committees put in long hours in pursuit of strategic goals. But as the latest OECD data indicates, this hard work is vital. A handful of local initiatives cannot by themselves improve the United States’ top-line skills proficiency, but they can help secure a community’s competitive future. And if nothing else, the represent what is possible at the moment. This is the work that can be done, so it is the work that should be done. Two weeks ago, I was afforded the opportunity to attend the Historically Black Colleges and Universities (HBCU) Community Economic Development Conference hosted by the U.S. Department of Housing and Urban Development (US HUD) and the HBCU Community Development Action Coalition here in Atlanta. The conference focused on educating attendees on what HBCUs are currently doing to move forward community development, what opportunities are available, and other strategic tips on how to maximize HBCU influence in communities that are often blighted, low-income, and even crime-ridden. I was especially interested and enthused to attend this conference because it fuses some of the major passions of my life—economic development, black communities, and my beloved HBCUs. I am a graduate of an HBCU—Tougaloo College in Mississippi, and I have family members, including my mom, who graduated from Jackson State University and Alcorn State University, also in Mississippi. HBCUs have always held a special place in my heart. I grew up attending JSU football games, where I was mesmerized by the Sonic Boom of the South (Jackson State’s award-winning band). I attended summer camp multiple summers at both Jackson State and Alcorn, where I spent time receiving standardized test preparation, enrichment in math and science, and connecting with other black scholars from around the state. 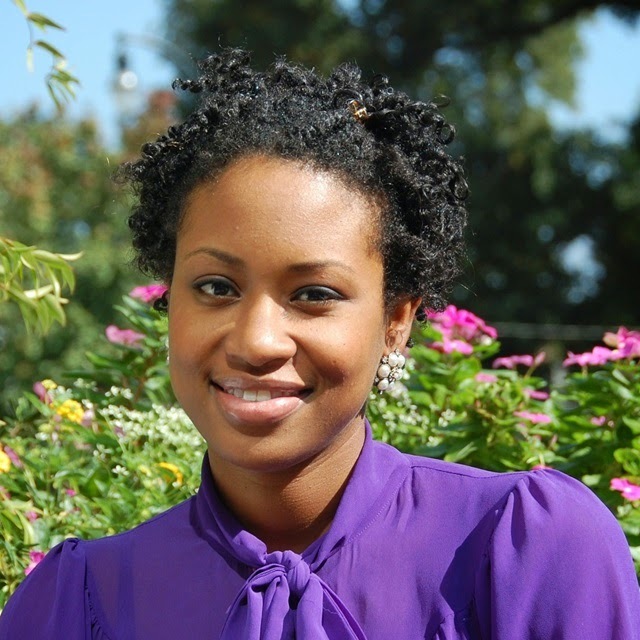 I came into my own as a student at Tougaloo, and I have never regretted my choice. HBCUs have been the places where African American students could receive a well-rounded post-secondary education when other opportunities were not available. HBCUs provide not only a cultural experience but a fundamental opportunity to obtain the necessary educational foundations required in a world that relies on skills and knowledge. As “anchor institutions,” HBCUs are not just student centers—they have traditionally provided much needed services to their surrounding communities, including recreational opportunities, training opportunities for non-traditional students, and even senior care and early education services. During the Civil Rights Movement, many HBCUs served as safe havens and provided meeting places for leaders,Freedom Riders, and the like. When I hear people ask what value HBCUs have in today’s world, several statistics come to mind: according to Thurgood Marshall College Fund, although HBCUs represent only three percent of the nation’s institutions of higher learning, they graduate nearly 20 percent of African Americans who earn undergraduate degrees. Additionally, HBCUs graduate more than half of African American professionals, including 80 percent of African American judges, 70 percent of African American dentists and physicians, 50 percent of African American engineers, and 50 percent of African American public school teachers. HBCU are indeed still necessary because workforce development is still imperative, and HBCUs are getting the job done – on meager budgets. According to Dr. Julianne Malveaux, former president of Bennett College, the combined endowments of all HBCUs equal less than ten percent of Harvard University’s endowment. The impact that HBCUs have, along with the established influence they have in black communities, make them viable partners for cities and regions around the nation. Making sure HBCU leaders are at the table when strategizing community-wide plans is imperative because they have established relationships and rapport with constituencies that may be otherwise untapped or underutilized. At the conference, I heard from college presidents as well as community development corporation directors about their current community and economic development strategies. Here are a few of the efforts HBCUs are employing to better the communities near their campuses around the country. Morgan State University, Baltimore, MD – Morgan Community Mile – The university reached out to more than 50 Northeast Baltimore neighborhood associations around its campus and developed a plan to improve the quality of life within a 12-square-mile area that is home to more than100,000 residents. Priorities addressed in the strategic effort include increasing health and safety on and off campus, providing additional educational and youth development opportunities within the neighborhoods, increasing economic and business opportunities, and continuing to create better relationships between the university and citizens. The school has also acquired land in a blighted area near campus and are developing three academic buildings, including a center for its Earl G. Graves School of Business and Management, slated to be completed in summer 2014. The other two buildings will be a behavioral and social sciences building and a school of community health. The development has been instrumental in improving the area, which includes a troubled shopping mall, Northwood Plaza. Rust College, Holly Springs, MS – Home Ownership Program – Rust College’s Community Development Corporation seeks to transform the low-income rural area near campus into a vibrant, self-sustaining community. To do this, they have begun constructing environmentally conscious homes with US HUD grant funding – to date, they have completed 11 of these homes. In addition, they have worked closely with the city to ensure that the area has nice streets, electricity, and water. The college provides new homeowners with education, counseling programs, and financial literacy classes. Winston-Salem State University, Winston-Salem , NC – Enterprise Center and Simon’s Green Acre Community Garden – WSSU’s S.G. Atkins Community Development Corporation has two ventures positively impacting its surrounding community. The Enterprise Center, which is housed in the redeveloped former Boys & Girls Club building in a blighted corridor, provides business development opportunities for small businesses and focuses on educating business owners on conservation and energy efficiency. The incubator is full and has a waiting list of entrepreneurs interested in moving in. A win-win for the university and for the community, students have been hired by member businesses over the summer, and one student was even hired full time. The Center has won an Economic Development Administration Award from the U.S. Department of Commerce. Simon’s Green Acre is a community garden created to address the status of the community as a food desert. Through this effort, WSSU students, faculty, staff, and community residents work to provide fresh produce and improve health outcomes –in just the past two years, the garden has produced 15,000 pounds of produce. The university offers hands-on learning opportunities to students and residents in sustainable horticulture and therapeutic gardening. Langston University, Langston, OK – T.G. Green Park Softball Field and Farmers Market – The Langston University Center for Community Engagement has leveraged US HUG grant funding to revitalize a dilapidated park into an NCAA regulation-size softball field and to construct a 3,600-square-foot Farmers Market. The university and the city both invested in this effort and have a memorandum of understanding that allows the university’s softball team to call the field home while also using it to train local children in intramural sports. The Center also leveraged funding to open a Farmers Market that provides space for local farmer and craftsmen to sell produce and other artisan goods. These are just examples of how HBCUs are taking their role as anchor institutions in oftentimes low-income communities seriously. HBCUs, like other universities, are pillars in our communities and should be considered strong partners in community and economic development efforts.